A study of African hunters has shown that a virus similar to HIV has passed from apes to humans from bushmeat of the kind that is being sold illegally in the UK. A leading scientist has told the File On 4 programme that the virus was probably passed on to tribesmen via body fluids when the animals were slaughtered and butchered. Assistant Professor Nathan Wolfe, who tested more than 1,000 hunters for Johns Hopkins University, US, found a retrovirus from the same family as HIV in a number of them. "This is the area of the world where HIV came from, and this is most likely the mechanism by which HIV emerged into the human population," he said. Although the full public health implications are still unknown, the fear is that the new virus could result in a new disease which would have global impact. The File On 4 team accompanied environmental health officers to spot inspections at London shops where they found illegal bushmeat from West and Central Africa. About five million tonnes of bushmeat, which originates from animals such as antelope, snakes, gorillas and elephants, is eaten in these regions of Africa every year. 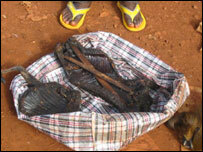 It is estimated that 12,000 tonnes of all manner of illegal meat is smuggled into the UK annually, a significant proportion of which is thought likely to be bushmeat. There may also be serious implications for the health of British domestic livestock as the foot-and-mouth outbreak was linked to illegal meat imports in 2001. Posing as rich white loggers and accompanied by an undercover worker from the Last Great Ape project, File On 4 journalists travelled to Cameroon where pygmy hunters offered to kill gorillas, seen as the best meat. All they wanted in return was the ammunition and the meat of the gorilla to eat. The journalists were offered the skull, palms, and legs of the gorilla free of charge as long as they could provide the bullets to shoot the animal. One pygmy said they had lost count of the number of gorillas they had killed. Abject poverty forces such hunters to kill any animal, no matter how rare or unfit for human consumption, and transport it out of the country through black markets. It is not known whether anybody has become sick from the virus. File on 4 was broadcast on Radio 4 on Tuesday 26 October at 2000 BST and repeated at 1700 BST on Sunday 31 October.